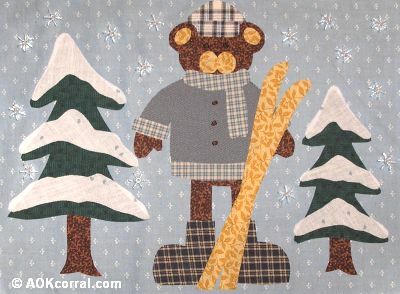 Use this bear applique design for your next winter theme project. Easy to do, free bear applique pattern. The Easy Print Version contains all instructions and patterns for the bear applique design. On a flat surface, turn the fabric so that the wrong side is facing up. Lay the pattern pieces right side down onto the wrong side of the fabric. Arrange the pieces onto your project as shown in the design layout placement guide. When each piece is correctly positioned, press a hot iron down onto the pieces and hold for 30 seconds. Pick up iron and place over more of the design. Do this over the whole design. Use a satin stitch to make the bear's eyes, nose and coat buttons with a dark brown embroidery thread. With white thread, sew on little clear paddle wheel beads at random locations around the top of the design for the look of snowflakes. This is a nice design to decorate winter theme projects.